Those who look closely might like to try to pick out the six days (“first day”, “second day”, “third day”, etc). We continue to be fascinated by zooms of these Mormon Wordles and are supplying a download jpg enlargement of a portion of the Genesis Chapter 1 wordle above. Its about a 300 kb file centered on the word “God”. Shortly later we made another attempt at wordling this text as shown below. I love this history of the creation of the earth provided by the Bible in the first book of the Old Testament. I still remember hearing those words from Apollo 8 in lunar orbit on Christmas eve back on December 24, 1968. William Anders, an Apollo 8 crew member, read these same verses to the world that night as the crew closed their Christmas eve broadcast. The other crew members, Jim Lovell and Frank Borman, also read from the first chapter of Genesis. They were the first men to leave earth orbit and fittingly, entered lunar orbit on Christmas eve 1968. 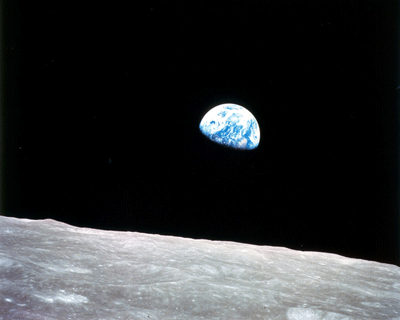 The same mission brought us the well known Apollo 8 Earthrise photo. Their image of the earth rising over a lunar horizon had a tremendous emotional impact on the world as we saw our planet from a new perspective. The earthrise image together with their reading of the first chapter of Genesis gave the world a much needed spiritual boost. Sometimes, I wish we could recapture our feelings from that time, and try to go forward now as a better people. We reworked some of the materials we used in preparing our earlier Mormon Wordle of Genesis Chapter 1 to created a lighted version. We widened the frame a bit, slightly changed the color schemes, lighted it using Photoshop Elements 8, then saved it as a PNG image to try to keep some of that brightness we see on our Mac for our PC visitors. We think the light blends well with the scriptural account of the creation of the earth. 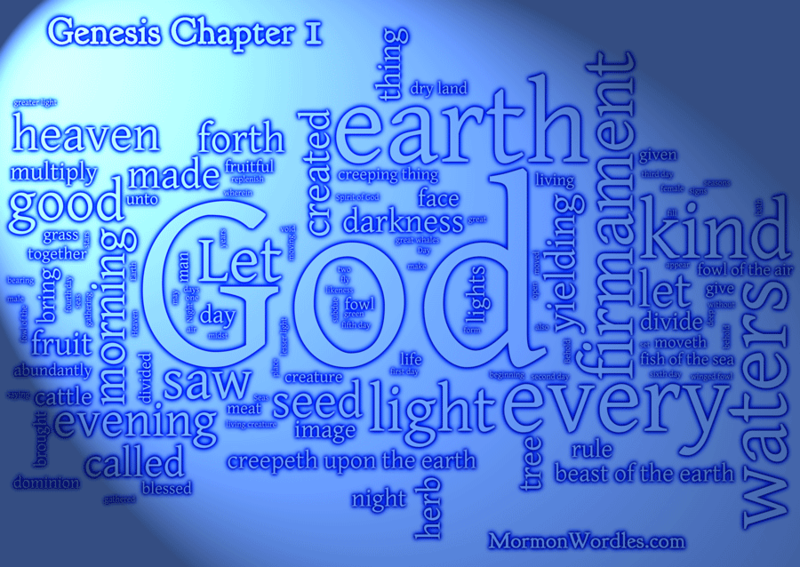 The lighted Mormon Wordle of Genesis Chapter 1 is below. We welcome your comments, but please no bashing creationism. The text and wordles above were originally hosted on our Mormon Wordles dot Com site. We moved them here in early 2017.